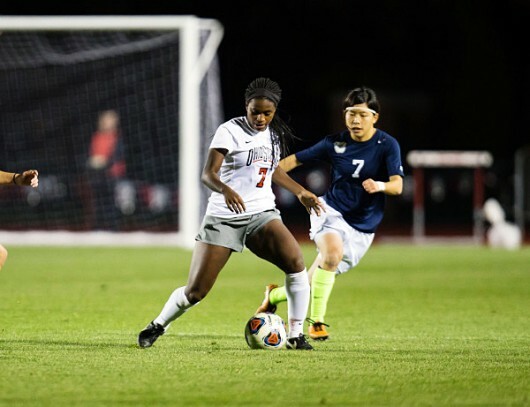 The Ohio State women’s soccer team is preparing to leave for State College, Pennsylvania, where it’s scheduled to take on the fourth-seeded Virginia Tech Hokies in the second round of the NCAA tournament on Friday. The Hokies were ranked 14th in the final regular-season National Soccer Coaches Association of America poll and enter Friday’s match 15-3-2 on the year. A huge challenge lies ahead for the Buckeyes, but senior co-captain and midfielder Michela Paradiso is confident in her team’s preparation for this game. The game is set to take place on a neutral site, which is designed to level the playing field, but OSU coach Lori Walker said she thinks Jeffrey Field presents an advantage for the Buckeyes. Walker said she reminds the team about what they have done throughout the season. She said every game leading up to this point has prepared them for this moment. Although 2015 marks the sixth time in the last seven years the Buckeyes have reached postseason play, Paradiso said this year is different, and the excitement around the team is building. “This is all our first time playing in the second round. A lot of people are just super excited about the opportunity to get to the Sweet 16 like teams have done in the past and to carry on that tradition of Ohio State,” Paradiso said. For Walker, her focus is not just what happens on the pitch during the game, but also making sure her players maintain a certain mental toughness to keep working throughout the month of November, a time when most teams’ seasons have already come to an end. To counteract that desire, Walker said she reminds her team of how much soccer will be missed when it’s over. When the game kicks off, Paradiso said the team is focused on playing one way, and if the Buckeyes do that, they will be OK with the result. Walker said with the level of talent the Hokies have, the Scarlet and Gray are going to have to do whatever they can to advance to the Sweet 16. The Buckeyes and Hokies are set to kick off in State College at 3 p.m. The winner of Friday’s match will advance to play the winner of the Penn State vs. Boston University game on Sunday. That game is slated to start at 1 p.m.